Your dog means everything to you. She’s a part of your family, and I know you’d do anything to ensure her happiness and well-being. That’s why it can be pretty upsetting when problems arise. As a responsible pet owner, knowing the tell-tale signs of trouble is key. Only then can you work to provide your dog with the immediate relief she needs. And, while some health conditions are difficult to avoid, others are preventable. One of those common conditions is called atopic dermatitis in dogs. Really, that’s a fancy name for itching, scratching, licking … you know the drill. The good news is, this skin condition is often preventable, but only if you know what to do. Atopic dermatitis is a skin disease that results from chronic inflammation. When a disease is chronic, it’s ongoing and rarely resolves on its own. The skin reactions of atopic dermatitis are primarily linked to allergies. Like us, our dogs can suffer from the unpleasant realities of allergies. But your dog can’t exactly tell you when she isn’t feeling her best. It’s up to you spot the symptoms and help her out. Atopic dermatitis in dogs can be both painful and stressful. If the symptoms are not treated, they can lead to the development of other, more severe, problems. The most common signs of atopic dermatitis are constant itching and scratching. 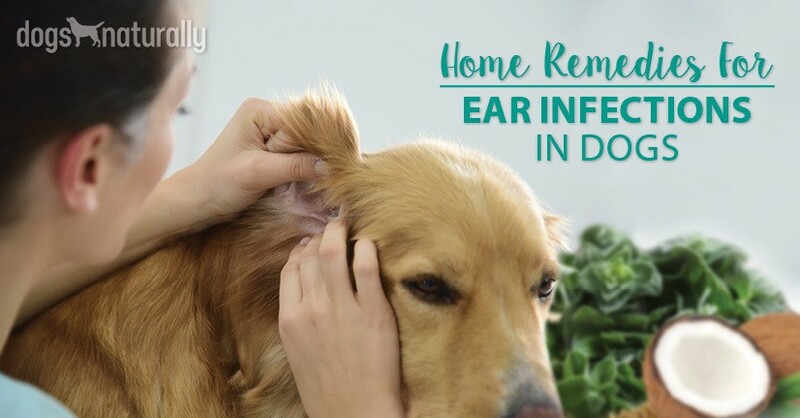 You may notice that your dog is up itching in the middle of the night and non-stop throughout the day. You may also notice your dog rubbing her body against furniture or walls to help relieve the itch. Persistent itching and scratching may not seem like a huge deal, but trust me, it can be. Contact scratching can cause self-inflicted cuts and abrasions. These open wounds are breeding grounds for bacterial infections. In turn, the infections can lead to even more itching and scratching. It’s a vicious cycle. You may also notice your dog licking herself more than usual. And no, I don’t mean just general cleaning. Again, while this may not seem like a troubling symptom, it can lead to the development of hot spots and open sores. If your dog has experienced hot spots, you know firsthand how awful they can be. Hot spots can develop overnight and spread like wildfire. It’s important to keep a close eye on your dog’s licking habits to help prevent the pesky sores. [RELATED] Are hot spots a problem? Here’s the ultimate guide to treating them naturally. Finally, with scratching, itching, rubbing and licking comes visible irritation and redness. Oftentimes, when symptoms become visible, they’ve been progressing for a while. Atopic dermatitis can develop anywhere on your dog’s body. That said, there are a few areas that seem to be a target. Symptoms of atopic dermatitis often first develop on the face and paws. But those aren’t the only spots. The best way to prevent disease is by understanding what causes it. I mentioned that atopic dermatitis is often caused by allergies. So, how can you limit your dog’s exposure to allergy triggers? By knowing all the things that can be a problem and working to eliminate them. But that’s not all! There are countless other environmental allergens that can lead to atopic dermatitis. A good rule of thumb to follow is that if it’s bothering you, it’s likely bothering your dog. Flea bites are another common cause of atopic dermatitis in dogs. 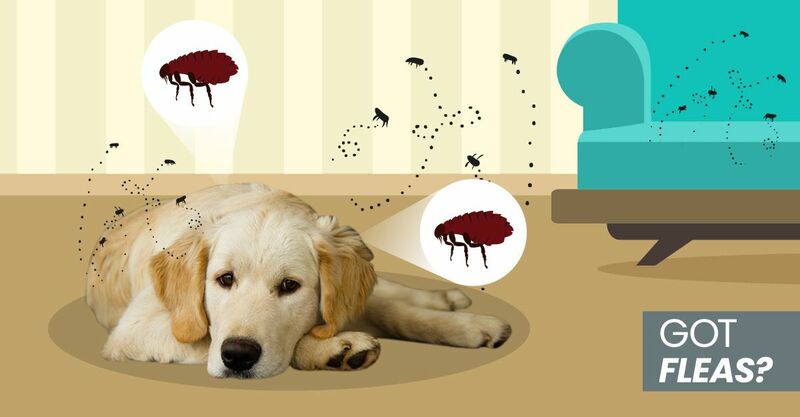 When flea bites are to blame, symptoms will often appear towards the base of the tail, but can quickly spread. It’s important for dog owners to understand their pet’s risk of flea bites. Find an all natural flea spray to keep those mini terrors off your dog. [RELATED] Too late to prevent fleas from setting up shop? Use these natural remedies to get them off your dog (and out of your house)! Atopic dermatitis can also result from skin-to-skin contact with an allergen. For instance, laundry detergent. If your dog is itching after you wash her bedding, it may be because she’s allergic to the new soap. Get rid of it. Another common cause of atopic dermatitis is seasonal changes. If you’re one of the 50 million Americans who suffer from allergies each year, you know how awful it can be. Be sure to stay alert during Springtime when flowers and trees are in bloom. They may be causing your dog’s allergies to act up and, in turn, causing atopic dermatitis is develop. Finally, food allergies can cause atopic dermatitis in dogs. More often than not, food allergies cause gastrointestinal problems like diarrhea and vomiting. But, in some cases, food allergies can lead to rashes and irritation. A common misconception with food allergies is that grain is the major culprit. In fact, the most common are beef, dairy, egg, chicken, lamb, soy, pork, rabbit and fish. It’s important to determine whether your dog is allergic to a specific food. If the situation is not resolved, skin irritation will be the least of your worries. [RELATED] How do you know if the atopic dermatitis is a result of a food allergy. Here are 5 signs to look out for. What’s the solution when your dog’s itching and scratching is a problem? A trip to the veterinarian will likely leave you with a conventional medication. Buyer beware. While many conventional allergy medications often promise quick results, are they worth it? These drugs come with a laundry list of potential adverse reactions that dog owners may not be aware of. Immuno-suppressants can cause the worsening of kidney disease and lead to irreversible damage. First, it’s important to understand how conventional allergy medications work. Allergies are how the body responds to a foreign invader. When the body sees a foreign element as a threat, the immune system reacts. That’s a good thing. Your dog’s immune system is supposed to temporarily react. Then you work to relieve the allergy symptoms. Also, since these drugs merely suppress the symptoms, your dog can quickly become dependent. If you stop the drugs the allergies will return. Even scarier news? These horrific side effects can develop when the medications is administered correctly. Sadly, that’s not all. There are even more precautions linked to conventional medications. Allergy medications can harm dogs that are pregnant, lactating or breeding. Again, this is due to its immune-suppressing properties. Additionally, dogs with pre-existing diseases should never take an immune-suppressing medication. Immunosuppressants can cause the worsening of kidney disease and lead to irreversible damage. [RELATED] There are several safe alternatives to these harmful drugs. Find out what to use instead right here. For good reason, dog owners are beginning to stay far away from these methods of treatment. Thankfully, there are holistic ways to reduce the symptoms of atopic dermatitis in dogs. Many of these treatments can also be used to prevent symptoms from developing in the first place. If you haven’t already heard about the incredible benefits of CBD oil for dogs, you’re in for a treat. When it comes to atopic dermatitis, CBD oil proves to be extremely effective. Derived from hemp, CBD oil is all natural and completely safe for our furry companions. CBD oil can also be used in several different ways. You can apply CBD oil directly onto your pet’s skin for immediate, soothing relief. CBD oil can also be added into your dog’s food bowl or placed on top of her favorite treat. [RELATED] Not sure about CBD oil just yet? Here are 10 things you may not know that will probably convince you! Coconut oil is chock full of vitamins and minerals that provide numerous health benefits. You can apply coconut oil directly onto your dog’s skin or mix it into her food. Coconut oil also has antibacterial and anti-inflammatory properties. When used topically, these help to restore skin health and prevent infections. Last, but not least, focus on diet! 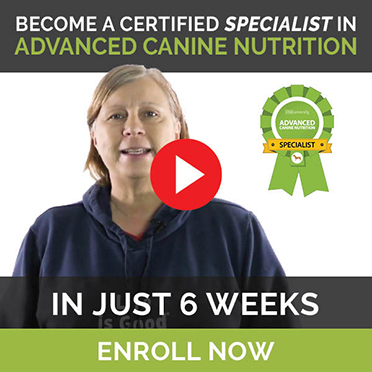 Your dog’s diet is perhaps the most effective way to prevent ailments from developing. Your canine’s diet should be free of by-products, chemicals and fillers. Firstly, reduce the yeast population in your dog’s body (yeast is a common allergy issue). A diet high in protein and fat and very low in carbohydrates (meaning zero grains and mostly green vegetables) will starve the cells. Introduce pre and probiotics to help improve gut heath (most of your dog’s immune system lives in her gut). If you suspect that your dog’s skin condition is a result of a food allergy, an elimination diet may be necessary. While this can be a long process, it is absolutely necessary. [RELATED] Food energetics can work wonders for your dog’s allergies. Here’s how to approach each type of allergy and which foods can help. At the end of the day, allergies are no fun for anyone. While most people experience sneezing and runny noses, our dogs are different. Their symptoms often manifest through skin conditions like atopic dermatitis. Recognizing the first signs of dermatitis is essential. Once you do this, you can work to reverse them in an all natural, effective way. With that said, we truly believe that prevention is the best medicine. Talk to your holistic veterinarian about how to best prevent atopic dermatitis. So often, the condition is avoidable. Ultimately, allergies can greatly affect your dog’s quality of life. By limiting exposure to the triggers, you can prevent atopic dermatitis in dogs.